MONKEYS ARE MY FRIEND: Just In Time! 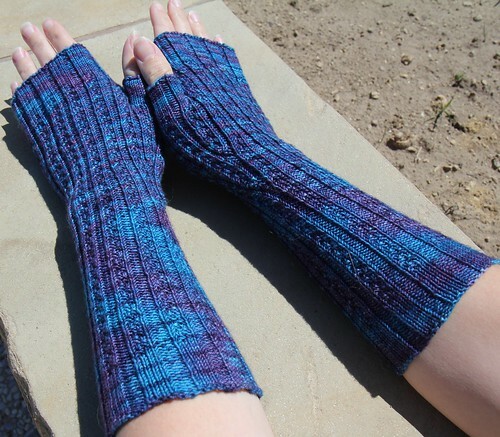 Just recently, I finished my third pair of fingerless mittens. My first two pairs each had issues: the thumb gusset on pair one was too small so that pair was rehomed and a bad yarn choice doomed pair two. But this pair? I think this pair is just right. Naturally, I finished them up right in time for the weather to get warm, so I figured I wouldn't be using them until next winter. Wrong! They were perfect last night during the eclipse. This pair is made with a broken rib pattern (that was actually entertaining for me instead of mind-numbing, which is how I normally see ribbing) so it is very elastic - no too tight thumb gusset! I also used a much better yarn choice for this pair (a yarn with a good twist and not single ply!) so they should hold up worlds better. Now here's hoping the weather will be too nice to wear them!